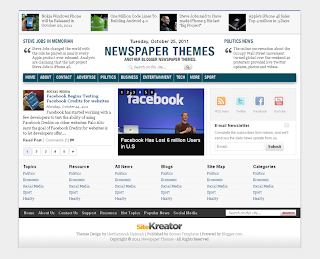 Template Description : Newspaper Themes is premium blogger template with simple featured slideshow, beautiful menu horisontal dropdown, 3 column header for quotes, search widget for your site, personal social bookmark on sidebar, share button ready on postpage, adsense and SEO ready, hosted image on blogger, best view on Mozilla, Chrome, Opera, IE 6,IE 7,IE 8 and IE 9, SEO friendly blogger title hack installed to help you rank higher in Google, and more. Single Use License : This License only can use for one blogspot or one custom domain, and can't use to many domains or sub-domains or other blogspot, you can't remove the credit link and no resell/distribution rights. Multiple Use License : This license can use to many blogspot or many custom domains or other sub-domains. You may remove the copyright information in the footer, you may remove the credit link and still no resell/distribution rights. We are sorry, this theme is currently under revision. Visited us soon. 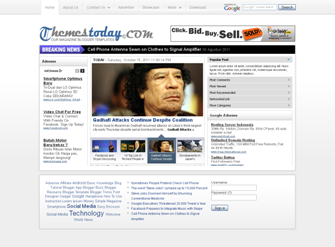 Template Description : Themes Today is premium blogger template with featured slideshow news like yahoo, beautiful accordion, horisontal navigation dropdown, share button ready on postpage, adsense and SEO ready, hosted image on blogger, best view on Mozilla, Chrome, Opera, IE 6,IE 7,IE 8 and IE 9, SEO friendly blogger title hack installed to help you rank higher in Google, and more. 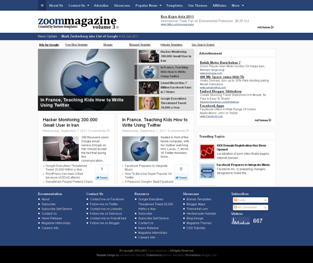 Template Description : Zoom Magazine Premium is premium blogger template with gallery themes, horisontal navigation dropdown, twitter like on frontpage, share button ready on postpage, adsense and SEO ready, hosted image on blogger, best view on mozilla, opera, IE 6,IE 7,IE 8 and IE 9, SEO friendly blogger title hack installed to help you rank higher in Google, and more. If you interested to buy this template, you can buy with PayPall by pressing button below. Thank you.